bird person, this book has something to offer you. 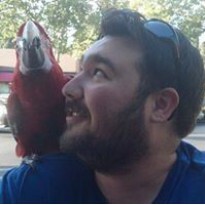 how one couple became bird obsessed. The story is told anecdotaly, each chapter focusing on a different bird and how it became woven into to the family. Whether for breeding, as pets (or in some cases both) the author takes you through each bird's extensive story. As I said each chapter is about a different type of bird. Besides the birds mentioned in the title you'll find stories about Macaws, African Greys, Amazons, Conures, and many more including a neat little chapter on the European Starling. The authors provide a nice overview of the bird, some insight into their experience with the bird and some thoughts on the breeding habits of the bird. In each chapter the authors speak to the reader as a friend, the book never comes off as a textbook nor does it espouse any specific opinion. In that, it's almost a memoir. And, they never shy away from the downside of raising birds. As with any story of raising animals, some are sadly lost along the way. 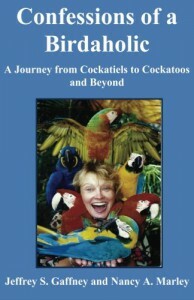 Particular sad is the story of Bozo, the blue and gold macaw to whom the book is dedicated. The chapter about Bozo, and his “partner” Keebler is typically light and cute but when the chapter turns to the sad state of Bozo's all too soon passing the writing takes on a more matter-of-fact tone as if the authors were trying to not delve too deeply into the painful memory. Which leads me to a frustrating aspect of this book- the authors don't go deep enough. The chapters are very short. At only 118 pages total, no chapter is more than 10 pages long. This leads to some stories feeling, rushed. It takes leaving the audience wanting more to a whole new level! That's not to say anything is left out per se, the stories are...complete, just rushed. Overall this is a fun book with a good message. Despite some rushed chapters, the overall amount of information and the sheer variety of birds covered makes this an interesting, not to mention entertaining read.